In addition to the burning sensation, many have characterized heartburn as a sharp pain coupled with a tightening sensation. Also, some people have described the pain as being mobile in that it vacillates between the neck and throat. Not surprisingly, the foods that we consume play a significant role when it comes to whether or not we experience heartburn. 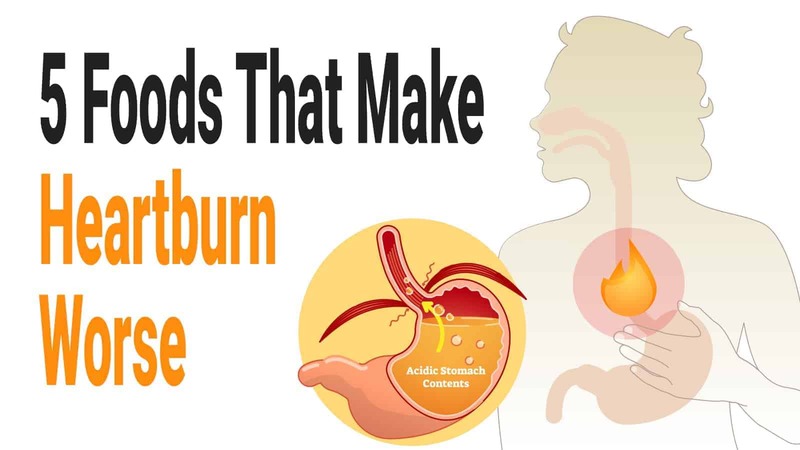 In this article, we will go over 5 foods that make heartburn worse as well as treatments that can help alleviate the symptoms. Before delving into treatments and foods that should be avoided to prevent heartburn, let’s take a closer look at the two conditions that contribute it, acid reflux and GERD. Although used interchangeably, these conditions are very different, despite contributing to the same general problem. It is also worth noting that certain medications like antihistamines, pain relievers, sedatives, antidepressants, and calcium blockers, for example, can significantly disrupt one’s digestive health. Fortunately, many digestive problems can be resolved through lifestyle changes like dietary changes, losing weight, limiting alcohol consumption, and quitting smoking, for example. 24-hour impedance-probe: This is a test that entails inserting a flexible tube into the nose and advancing it into the esophagus, which can help physicians determine whether or not acid is refluxing beyond the esophagus. Upper endoscopy – While sedated, a tube fitted with a camera is inserted into the patient’s mouth and is passed through the stomach until it reaches the small intestine. An upper endoscopy test is useful in that it allows physicians to detect tumors, inflammation, ulcers, and other signs of damage that may be contributing to digestive problems. Unless you’re vegan or vegetarian, you probably enjoy steak, chicken, and even pork chops when dinner time rolls around, but it is important that we recognize that these foods can cause digestive problems. In fact, according to an article published in the Gastroenterology Research and Practice Journal, a peer-reviewed and open access, meat has been linked to esophagitis and GERD. The study cited high cholesterol and fatty acids associated with most cuts of meat as the primary reason. However, high sodium, oils, and fats also play a role. For example, the high-fat found in most meat can cause sphincters in the stomach to relax, a condition that can lead to GERD and other digestive problems. Of course, we are not suggesting that you avoid meat altogether, but it may be a good idea to limit how much of it you consume. In reducing how much meat you consume, you also reduce your cholesterol intake, which is important since studies show that there is a correlation between high cholesterol and impaired digestive health. In fact, according to study in the Alimentary Pharmacology and Therapeutics, a peer-reviewed medical journal, a diet high in cholesterol and saturated fatty acids can lead to acid reflux and GERD. So in addition to limiting how much meat you consume, it may be a good idea to consume fewer eggs, as well as certain dairy products, as these foods are also very high in cholesterol. In addition to being one the primary contributors to high blood pressure, high-sodium foods like smoked, cured, salted or canned meat, for example, are notorious for causing stomach bloating and a variety of digestive problems. The same applies to frozen foods, processed meats, or any food where salt is the primary preservative. Basically, the salt in these foods causes fluid retention in the body, which, in turn, causes bloating, digestive problems and, in extreme cases, may lead to stomach cancer. Along with damaging tooth enamel, acidic foods like tomatoes, grapefruit, lime, and lemons, for example, can cause the lining of the stomach to become inflamed, resulting in digestive problems. Some of these problems include indigestion, gas, constipation, bloating, and diarrhea. It is important to note that tomatoes are used in a wide for a variety of foods including pizza, spaghetti, and a number of cooking sauces. Despite being delicious, chocolate can wreak havoc on one’s digestive system, especially chocolate containing artificial sweeteners. Studies show that this seemingly innocuous treat can trigger an upset stomach, diarrhea, indigestion, and loose stool. 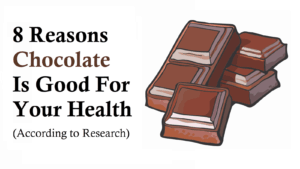 Ideally, if you’re going to consume chocolate, it is best to avoid any that contain artificial sweetener and to also limit your consumption. Along with food, certain beverages can adversely affect your digestive health. That said, it is a good idea to limit the amount of alcohol, coffee, and caffeinated drinks that you consume. The same applies to acidic beverages like lemon juice, orange juice, and grapefruit juice. Getting back to foods, you should also avoid consuming too many greasy or spicy foods. Trigger foods are those foods that can cause a flare-up of digestive symptoms. While the extent of those flare-ups can vary from person to person, there is anecdotal evidence that suggests the probability of experiencing some degree of digestive problems is greater with some foods over others. It is also worth noting that certain foods can significantly improve digestive problems. In summation, there are a number of foods that can work for and against your digestive health. It is important to be mindful of the foods you consume and take an active role in maintaining an overall healthy diet. To make this process easier, it would be a good idea to work with a dietician or nutritionist, especially if you are prone to digestive problems.